How Doctors Should Apply the Cashflow Quadrant | Passive Income M.D. This is the second post of a two-part series on the cash flow quadrant. The first explained what the cash flow quadrant is and in this second post, we’ll talk about how doctors can apply the cash flow quadrant to achieve financial freedom. This post contains affiliate links. In my previous post, I explained the concept of the “cashflow quadrants” and where most doctors fit into it. 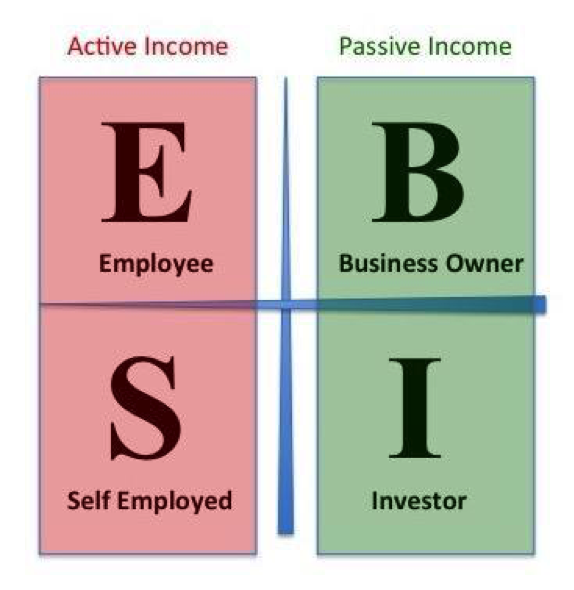 We also divided the quadrants into two sides: the “active income” side (left) and the “passive income side” (right). In short, most physicians live on the left side of the quadrant, where we trade time for money. (Time in = Money Out). Unfortunately that often puts us in a situation where we might make a decent income, however we’re short on the most precious resource, time. If this doesn’t sound familiar to you, please go back and read the first post! Once you have, let’s dive right into part two. I’ve said it before and I’ll say it again: I believe that for most of us, the secret to a happy career in medicine is to make it a hobby. If you can achieve this, then you’ll be practicing medicine on your own terms, and for the pure love of treating and caring for patients. But to accomplish this, we need to be able to rely on other, more passive forms of income. The right side of the quadrant is where financial freedom sits. It’s key to be very familiar with the concept of the cash flow quadrants and to understand it well. Make sure you’ve read my first post, and for even more info, read Robert Kiyosaki’s book. Identify your position in these quadrants. Or have you already begun your journey to the right side? Additionally, you need to know what your net worth is, as well as your expenses. I suggest using Personal Capital if you don’t already. Without your eyes on the finish line, it’s hard to know what direction to run in. In reality, the journey will never be a straight line, but in order to continually course correct, it helps to know where you’re trying to go. Are you happy where you’re at, and do you desire financial freedom? Do you want to retire early? At what age? Do you want to be a business owner, investor, or both? How much time and effort do you want to put into this? Write these things down and keep them always in your mind. Give yourself something to work toward. Educate yourself–and understand the risks. I can’t stress enough how important it is to read every financial book you can get your hands on. And not only books–check out blogs, listen to podcasts, and find success stories of those that have reached the goals you want for yourself. The more informed you are, the smoother your journey will be. Here is also a list of my favorite investing, business, and finance books to help you take this all important step. Go for it. Whether it’s starting your own business or investing in real estate, at some point, there’s only so much analysis you can do. As physicians we’re trained to take all the information we can find and make an evidence-based decision. The truth is, you’ll never find one definitive risk-free answer. You have to make the best-educated leap you can make and get your hands dirty. That might mean buying a rental property, getting into real estate crowdfunding, etc. Whatever you choose, follow up on those goals with action. I was introduced to the concept of cash flow quadrants after finishing my training, and once I read Kiyosaki’s book, I saw the importance of pursuing additional streams of income as early as possible. Yes, it would’ve been easier to simply go to work think about passive income later in life. My goal was to achieve financial independence about fifteen years after training. Thankfully, I was able to reach it in six. Unfortunately, as physicians, we’re taught one path to the top and when we achieve career success… then what? At that point, will you have the time and resources to live your life how you want? As mentioned in my previous post, as high-income professionals, we do have the opportunity to save, invest wisely, and more quickly move into the right quadrant–particularly as the investor. I’ve heard story after story of physicians doing that very thing. Some used the stock market to get there and some have used real estate. Ultimately, once your research is done, the key is to make a plan and commit to it. You may reach financial freedom faster than you think. What’s your plan to be on the right side of the cashflow quadrant? I’m glad to say I have income from all 4 quadrants now. It isn’t essential to be in all four but having only one is too risky for sure. Many doctors have moved from B to S and are now moving to E. Even with a high salary living in E is highly taxed and insecure. Not everyone should be in B. Everyone can have a strong I quadrant to counteract the S or E though. Simply save and invest! Yes, doctors seem to be moving in the wrong direction on this path. 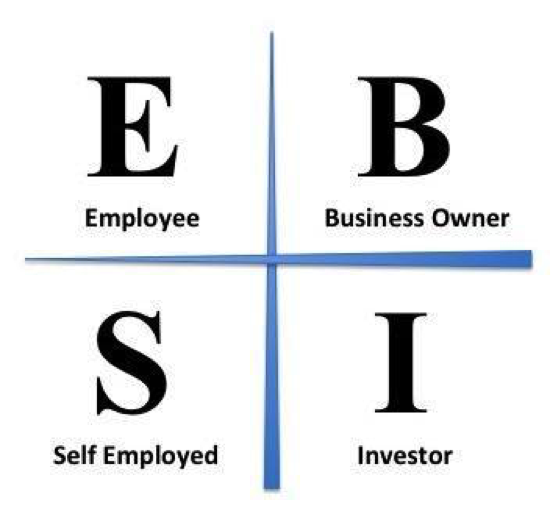 You’re right, not everyone should be in the B, but absolutely need to then work on the I quadrant – making their money work for them. The most difficult part is to get a B position. Not many people reach that level. I am always wondering why not? Getting in the B position requires a good amount of time, energy, and commitment. Doctors have the skill and determination, unfortunately they don’t have much time & energy to devote to anything outside of their jobs and family time. They can reach the “I” position by smartly saving and investing wisely however. Cool concept. I do get crushed by taxes and am glad to be an investor for that reason. I think your step 5, Go For It is most pertinent to me. As docs, we tend to think we won’t act until we read all there is to know. That leads me to analysis paralysis. I want to make the leap to some real estate and have done the leg work. I need the motivation to go for it. I’m all about maximizing the I and minimizing the E.
I left E at 35. Started I at 31. Did well with S as long as I was willing to work crazy hours. Now I dwarfs S and S is a hobby. Learning how to transition is the tricky part for me. As someone who is starting the journey to becoming financially independent after finishing training (and, unfortunately, being on the late bus to the financial information available to all of us), the road seems somewhat daunting! Thanks for the encouragement that the work is worth it in the end! It’s never too late. Kudos for starting that journey. You’ve got a decent paying job so I assume you can be in the I quadrant if you’re disciplined. Thanks for stopping by!